I have a moderately serious question for anyone at Capsicum who can possibly answer it. The flight stand pegs measure 42mm, from the top of the disc to the tip of the peg. Most of the ships seem to then be an average height of about 42mm above the disc, to the horizontal centerline of the ship itself. Is there a reason for the ships to float so high above the game board? How was this total height decided? I was thinking primarily for storage, and also to preclude ships tipping over on the board; that if the stands were about 15mm shorter, would they work just as well visually? I have made one or two experiments with my own custom stands at the lower height, and it seems to be just as nice looking, with less chance of the ships tipping over. Do you have some picture to show us ? 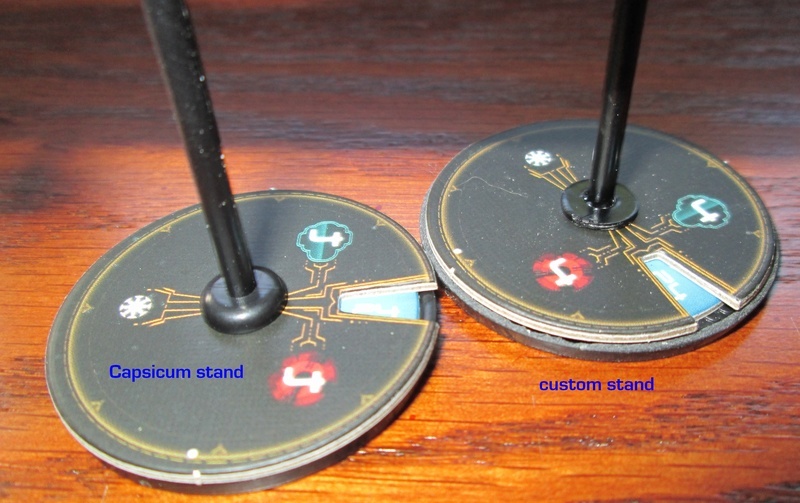 Two images showing a flight stand with peg 15mm shorter than the Capsicum normal (the base is from Games Workshop, the peg is 2.5mm styrene rod). I did end up finding a way to make new stands to use if you break one of the originals. Step One: Acquire the 40mm disc base without holes from 'Games Workshop' (their #99379999023, and are actually closer to 39mm), they are then 38mm after cutting down their height as shown below. Original Capsicum discs are 36mm. Use them "upside-down", and remove four of the five inner bosses (leave the center one in place). Trim the outer edge lip down to the thickness of the numbered inner cardboard disc from 'Genesis'. Use a 1/4" (6.35mm) hole punch through the 'Genesis' upper disc, then a length of 2.5mm styrene rod for the post, and an 8mm disc of .75mm styrene with a 3.5mm hole in the center (more use of hole punches) to make the keeper ring that holds everything together. Works the charm, if a bit tiresome to make, and almost un-noticeable compared to the original stands. Be advised though, the styrene that Games Workshop uses for the bases is really poor quality (most likely it's cheap regrind), and can shatter or split at any stage during cutting and trimming if you aren't careful. good question about the pegs indeed. Actually, I can't remember any key reason for the length of the peg. We made some test a found this one good looking. Your proposal is very interesting, indeed for pragmatical reasons. I think I'll try to build a set like this to see what happens. Interesting, Didier! I had thought maybe there was some scientific reason for the height, but like many things it just evolved from practice. I hesitate to cut all my pegs shorter, but the savings on storage space in the box could be considerable. 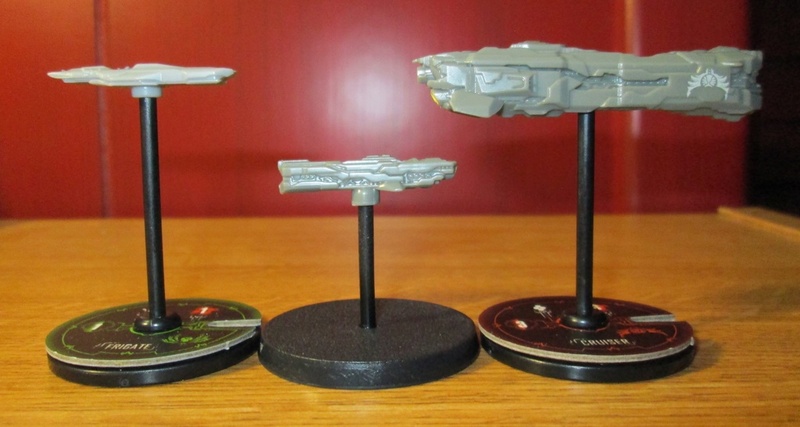 Since it is unlikely I will ever use my ships with anyone else from their game box, the fact that they do not match in height is not so important. I would be interested to see what you think and feel about the lower height after you test one for yourself.